An Internet service provider (ISP) is an organization that provides services for accessing and using the Internet. Internet service providers may be organized in various forms, such as commercial, community-owned, non-profit, or otherwise privately owned. On 26 February 2015, the FCC ruled in favor of net neutrality by adopting Title II (common carrier) of the Communications Act of 1934 and Section 706 in the Telecommunications Act of 1996 to the Internet. The FCC Chairman, Tom Wheeler, commented, "This is no more a plan to regulate the Internet than the First Amendment is a plan to regulate free speech. They both stand for the same concept." On 12 March 2015, the FCC released the specific details of the net neutrality rules. On 13 April 2015, the FCC published the final rule on its new "Net Neutrality" regulations. ISPs provide Internet access, employing a range of technologies to connect users to their network. Available technologies have ranged from computer modems with acoustic couplers to telephone lines, to television cable (CATV), wireless Ethernet (wi-fi), and fiber optics. Many mailbox providers are also access providers, while others are not (e.g., Yahoo! Mail, Outlook.com, Gmail, AOL Mail, Po box). The definition given in RFC 6650 covers email hosting services, as well as the relevant department of companies, universities, organizations, groups, and individuals that manage their mail servers themselves. The task is typically accomplished by implementing Simple Mail Transfer Protocol (SMTP) and possibly providing access to messages through Internet Message Access Protocol (IMAP), the Post Office Protocol, Webmail, or a proprietary protocol. 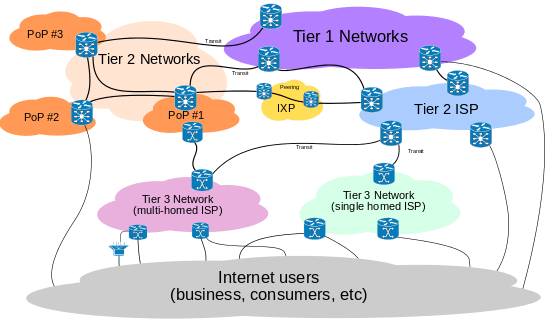 ISPs requiring no upstream and having only customers (end customers and/or peer ISPs) are called Tier 1 ISPs. Internet service providers in many countries are legally required (e.g., via Communications Assistance for Law Enforcement Act (CALEA) in the U.S.) to allow law enforcement agencies to monitor some or all of the information transmitted by the ISP. Furthermore, in some countries ISPs are subject to monitoring by intelligence agencies. In the U.S., a controversial National Security Agency program known as PRISM provides for broad monitoring of Internet users traffic and has raised concerns about potential violation of the privacy protections in the Fourth Amendment to the United States Constitution. Modern ISPs integrate a wide array of surveillance and packet sniffing equipment into their networks, which then feeds the data to law-enforcement/intelligence networks (such as DCSNet in the United States, or SORM in Russia) allowing monitoring of Internet traffic in real time. ↑ "Web history timeline". Retrieved 2015-09-21. ↑ Clarke, Roger. "Origins and Nature of the Internet in Australia". Retrieved 21 January 2014. ↑ Wyatt, Edward (23 April 2014). "F.C.C., in 'Net Neutrality' Turnaround, Plans to Allow Fast Lane". New York Times. Retrieved 2014-04-23. ↑ Staff (24 April 2014). "Creating a Two-Speed Internet". New York Times. Retrieved 2014-04-25. ↑ Carr, David (11 May 2014). "Warnings Along F.C.C. 's Fast Lane". New York Times. Retrieved 11 May 2014. ↑ Crawford, Susan (28 April 2014). "The Wire Next Time". New York Times. Retrieved 2014-04-28. ↑ Staff (15 May 2014). "Searching for Fairness on the Internet". New York Times. Retrieved 15 May 2014. ↑ Wyatt, Edward (15 May 2014). "F.C.C. Backs Opening Net Rules for Debate". New York Times. Retrieved 15 May 2014. ↑ Wyatt, Edward (10 November 2014). "Obama Asks F.C.C. to Adopt Tough Net Neutrality Rules" Check |url= value (help). New York Times. Retrieved 15 November 2014. ↑ NYT Editorial Board (14 November 2014). "Why the F.C.C. Should Heed President Obama on Internet Regulation". New York Times. Retrieved 15 November 2014. ↑ Sepulveda, Ambassador Daniel A. (21 January 2015). "The World Is Watching Our Net Neutrality Debate, So Let's Get It Right". Wired (website). Retrieved 20 January 2015. ↑ Weisman, Jonathan (19 January 2015). "Shifting Politics of Net Neutrality Debate Ahead of F.C.C.Vote". New York Times. Retrieved 20 January 2015. ↑ Staff (16 January 2015). "H. R. _ 114th Congress, 1st Session [Discussion Draft] - To amend the Communications Act of 1934 to ensure Internet openness..." (PDF). U.S. Congress. Retrieved 20 January 2015. ↑ Lohr, Steve (2 February 2015). "In Net Neutrality Push, F.C.C. Is Expected to Propose Regulating Internet Service as a Utility". New York Times. Retrieved 2 February 2015. ↑ Lohr, Steve (2 February 2015). "F.C.C. Chief Wants to Override State Laws Curbing Community Net Services". New York Times. Retrieved 2 February 2015. ↑ Flaherty, Anne (31 January 2015). "Just whose Internet is it? New federal rules may answer that". AP News. Retrieved 31 January 2015. ↑ Fung, Brian (2 January 2015). "Get ready: The FCC says it will vote on net neutrality in February". Washington Post. Retrieved 2 January 2015. ↑ Staff (2 January 2015). "FCC to vote next month on net neutrality rules". AP News. Retrieved 2 January 2015. ↑ Lohr, Steve (4 February 2015). "F.C.C. Plans Strong Hand to Regulate the Internet". New York Times. Retrieved 5 February 2015. ↑ Wheeler, Tom (4 February 2015). "FCC Chairman Tom Wheeler: This Is How We Will Ensure Net Neutrality". Wired (magazine). Retrieved 5 February 2015. ↑ The Editorial Board (6 February 2015). "Courage and Good Sense at the F.C.C. - Net Neutrality's Wise New Rules". New York Times. Retrieved 6 February 2015. ↑ Weisman, Jonathan (24 February 2015). "As Republicans Concede, F.C.C. Is Expected to Enforce Net Neutrality". New York Times. Retrieved 24 February 2015. ↑ Lohr, Steve (25 February 2015). "The Push for Net Neutrality Arose From Lack of Choice". New York Times. Retrieved 25 February 2015. ↑ Staff (26 February 2015). "FCC Adopts Strong, Sustainable Rules To Protect The Open Internet" (PDF). Federal Communications Commission. Retrieved 26 February 2015. ↑ Ruiz, Rebecca R.; Lohr, Steve (26 February 2015). "In Net Neutrality Victory, F.C.C. Classifies Broadband Internet Service as a Public Utility". New York Times. Retrieved 26 February 2015. ↑ Flaherty, Anne (25 February 2015). "FACT CHECK: Talking heads skew 'net neutrality' debate". AP News. Retrieved 26 February 2015. ↑ Liebelson, Dana (26 February 2015). "Net Neutrality Prevails In Historic FCC Vote". The Huffington Post. Retrieved 27 February 2015. ↑ Ruiz, Rebecca R. (12 March 2015). "F.C.C. Sets Net Neutrality Rules". New York Times. Retrieved 13 March 2015. ↑ Sommer, Jeff (12 March 2015). "What the Net Neutrality Rules Say". New York Times. Retrieved 13 March 2015. ↑ FCC Staff (12 March 2015). "Federal Communications Commission - FCC 15-24 - In the Matter of Protecting and Promoting the Open Internet - GN Docket No. 14-28 - Report and Order on Remand, Declaratory Ruling, and Order" (PDF). Federal Communications Commission. Retrieved 13 March 2015. ↑ Reisinger, Don (13 April 2015). "Net neutrality rules get published -- let the lawsuits begin". CNET. Retrieved 13 April 2015. ↑ Federal Communications Commission (13 April 2015). "Protecting and Promoting the Open Internet - A Rule by the Federal Communications Commission on 04/13/2015". Federal Register. Retrieved 13 April 2015. ↑ microsoft. com/en-us/windows-vista/what-are-the-different-internet-connection-methods What are the different Internet connection methods? ↑ thefoa. org/FTTX/ "FTTx: Fiber To The Home/Premises/Curb" Check |url= value (help). The Fiber Optic Association. Retrieved June 1, 2013. ↑ "CCNA". ciscoccna24.blogspot.com. Retrieved 2 February 2015. ↑ J.D. Falk, ed. (November 2011). Complaint Feedback Loop Operational Recommendations. IETF. RFC 6449. https://tools.ietf.org/html/rfc6449. Retrieved 28 June 2012. ↑ Murray Kucherawy, ed. (June 2012). Creation and Use of Email Feedback Reports: An Applicability Statement for the Abuse Reporting Format (ARF). IETF. RFC 6650. https://tools.ietf.org/html/rfc6650. Retrieved 28 June 2012. ""Mailbox Provider" refers to an organization that accepts, stores, and offers access to RFC 5322 messages ("email messages") for end users. Such an organization has typically implemented SMTP RFC 5321 and might provide access to messages through IMAP RFC 3501, the Post Office Protocol (POP) RFC 1939, a proprietary interface designed for HTTP RFC 7230, or a proprietary protocol." ↑ NSA PRISM Creates Stir, But Appears Legal. InformationWeek. Retrieved on 2014-03-12. ↑ "Obama's Speech on N.S.A. Phone Surveillance". New York Times. 17 January 2014. Retrieved 21 January 2014. ↑ "New KGB Takes Internet by SORM". Mother Jones. Retrieved 2 February 2015.